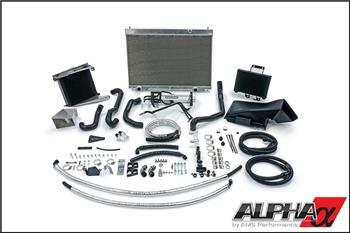 Alpha Performance Cooling Kit NISSAN - Dezod Motorsports Inc - Home of the automotive performance enthusiast since 2002. From the factory, your GT-R’s engine and transmission share the same inadequate cooling system. Thus, prolonged street abuse or even short stints in racing conditions cause components in the engine and transmission to overheat. This breaks down the engine and transmission oils and will ultimately cause the GT-R to fall into limp mode or shut down. As a solution, our engineering team spent the past year developing, testing and perfecting the most advanced cooling solution for your R35 GT-R. The Alpha GT-R Cooling System upgrades the R35 GT-R’s current engine cooling system with a quality, race spec, radiator along with an extremely efficient transmission cooler and an additional in-line engine oil cooler. Simply upgrading one or two of the cooling systems like our competitors simply isn’t enough because all the systems affect each other. By upgrading every portion of the GT-R’s cooling systems, our cooling package is simply the most effective and comprehensive on the market allowing you to stay on track longer and safer than ever before! The factory radiator is replaced with a larger, Griffin made, dual pass, all-aluminum unit. The dual pass design increases the fluid velocity through the core which promotes greater heat transfer. The Alpha radiator uses all the OEM mounting hardware and has provisions to mount the A/C condenser in the factory location. Another key component is our Laminova, high volume, liquid-to-liquid, transmission cooler. The cylindrical design of the heat exchanger within the cooler maximizes contact area for the transmission fluid through thousands of heat dissipating fins. This design offers 20% more cooling efficiency than a traditional style air to oil cooler used by our competitors. Finally, to ensure the oil within your GT-R’s engine maintains its necessary lubricating properties, the Alpha cooling kit addresses the inadequate factory engine oil cooler by adding an additional cooler in series. The new Setrab cooler doubles the frontal area in the system exposed to cool, dense, outside air – drastically reducing oil temperatures prior to it returning to the engine. Our optional race cooling kit adds an additional external oil cooler along with a molded plastic duct to draw in fresh air. This upgrade is optimal for GT-R owners in climates such as the Middle East or Southern United States and owners who frequently track their GT-R for long periods of time. Regardless of what type of performance modifications you have, hard driving or warm climate conditions will cause your GT-R to run hot. You’ll need the Alpha GT-R Cooling System to keep your operating temperatures down, prevent limp mode conditions and eliminate the possibility of catastrophic engine or transmission failure.